Gran Turismo 4 was meant to be out in 2004. Wasn't out until 2005. Gran Turismo 5 has been delayed twice now. Why, then, can't developers Polyphony Digital get a game out the door on time? 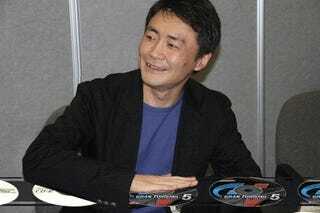 It comes down to past experience, when a game shipped last millennium as "finished" scarred series creator Kazunori Yamauchi (pictured) for life. "The first game that I made was Motor Toon Grand Prix for the first PlayStation", Yamauchi tells AutoWeek. "The year and a half that it was in development, the last three months as the release date approached, myself and my staff were getting three hours of sleep a day to try and get the game done. Near the end, the people from Sony came to our development studio and told us it was good enough and that we could release it. At the time, I probably wasn't thinking very clearly, being as exhausted as I was, and I talked myself into thinking this was good enough and it went to release." "But all the things I thought were not enough yet, the users said the exact same thing when the game came out. That was something I regretted very much when that happened because I knew it was coming. And that happened at the beginning of my career, and it was something I vowed would never happen again." Take note, Gran Turismo fans. That's not a note. It's not a promise. It's a vow. If the man is not 101% happy with a game, it's not being released, even if you have to wait five years for it. And when he's happy? Well, then it's off to the printers.